U.S. Attorney General Alberto Gonzalez has called it "a unique and deadly threat to our nation -- which destroys lives far beyond those of just the addicts and the users." More than 12 million Americans are believed to have tried it, and 1.5 million are regular users. Nearly 10,000 clandestine labs that produce it were discovered in one year alone. And the U.S. Office of National Drug Control Policy lists 130 nicknames for it, ranging from "speed" and "chrome" to "geep" and "scootie." It is methamphetamine (meth), and it has become the fastest growing drug scourge to hit the United States since the crack epidemic of the early 1990s. Easy to find and relatively simple to manufacture, it produces an intense euphoric sensation called a "rush," described as an extremely pleasurable high of hyper-alertness, extreme energy, and confidence. Users become addicted quickly and use it with increasing frequency and in increasingly large doses. Of the thousands of meth labs busted in the United States, more than half of them were located in houses. Other common sites for the clandestine labs are trailers and vans, apartments and condos, and hotels and motels. Meth does incalculable damage to human health and the environment. To the environmental professional, the growing plague of home-based, clandestine drug labs should be a special concern. Nearly 60 percent of U.S. county officials have said that meth is the largest drug problem in their county, and 87 percent experienced an increase in meth arrests in the past three years, according to a survey released in July 2005 by the National Association of Counties. The biggest difference between the problems caused by other hard drugs, like heroin and crack, and meth is the devastating impact its production has on the environment. Consider this: for every pound of cooked meth produced, it is estimated that five pounds of hazardous chemical waste are also produced. Cooking generates a long list of noxious solvents and gases, such as hydrogen chloride, phosphine, and meth itself. These byproducts not only stay on the premises, contaminating all surfaces and seeping into walls, floorboards, and carpeting, but often migrate through heating, ventilation, and air conditioning (HVAC) duct systems into adjoining apartments or hotel rooms. The highly volatile chemicals also present a common but fatal danger -- explosion and fire. According to U.S. Department of Justice (DOJ) expert and National Alliance for Drug Endangered Children Training Coordinator Ronald Mullins, fully one-third of clandestine labs are discovered by law enforcement as a result of fire or explosions in the labs. 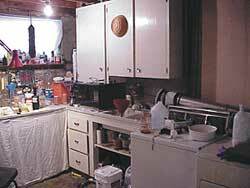 The people who are operating the meth labs generally cook several batches of the drug each week, usually under the influence of meth or other drugs, Mullins pointed out, and their living conditions are ones of "incredible filth and disarray." And how do they dispose of the toxic waste they generate? "They dig a hole in the ground, pour it into the backyard, pour it down the kitchen drain, bury it in the woods or the desert, or dump it into the septic tank," he said. "Soil and groundwater contamination, release of toxic fumes and poisonous gases, and other dangers cannot be overestimated." Tackling the meth-lab problem demands collaboration among law enforcement officers, environmental consultants, and environmental contractors. When meth labs are discovered, law enforcement officers must be properly trained to enter the premises -- which can be booby trapped to deter intruders -- and do a proper investigation. DOJ and state and local law enforcement organizations across the country are now training personnel on all phases of investigation, seizure, arrest, dismantling, waste removal, and remediation of contaminated property. Evidence is photographed and cataloged, and environmental consultants are brought in to take samples and analyze the materials found. Chemicals often used in meth production include: iodine crystal, hydrogen chloride, acetone, lithium metal, red phosphorus, ether, lye, alcohol, and Freon®. When cooked over a stove or hot plate, these substances can combine to produce meth. Since evidence-handling protocols throughout the United States do not allow hazardous waste of any kind to be kept, it is essential that the investigation be thorough. Currently, the state of Washington's Clandestine Drug Program is considered the "gold standard" nationwide for all aspects of drug lab identification, training, and decontamination contractor certification. It is one of the few states at present that require its contractors to be certified by the state (Montana just passed a law for this; Utah and others are working on it). After an environmental consultant has made a thorough inspection of the premises of a meth lab, including HVAC duct work and adjoining areas, remediation by a certified contractor begins. Once this phase begins, it actually follows the same remediation procedures as any commercial or industrial cleanup. How the remediation is handled depends on what type of waste is present, how much has been dumped, and how long the contamination has been going on. Typical personal protective equipment includes Hazmat suits, with filtration-equipped respirators. Of particular concern are needle pokes that may transmit HIV or Hepatitis B, so technicians wear heavy protective gloves, usually made of leather. Heavy-soled shoes are a must. The next step is removing every movable object in the room, including drapes, carpeting, furniture, dishware, and toys. Any place where rust is seen is most likely a site of contamination. Acids and bases are used in the cooking process, so neutralization must take place. (Cooking equipment, including beakers, hot plates, and other utensils, have already been removed as evidence by the police.) These items are bagged and disposed of properly, according to the level of exposure indicated by the consultant. When necessary, paneling, acoustic tiles, and other porous surfaces must also be removed. Cleaning is done with a detergent wash, starting at the ceiling and washing and rinsing three times. Drywall can be damaged by the washing process and may need to be removed. The final area to be washed is the floor, which is cleaned thoroughly. It is recommended that walls with minimal contamination be painted with oil-based paint in order to encapsulate any residue. Septic tank contents must be tested. The most common types of contaminants expected to be discharged into septic systems are solvents (e.g. toluene, xylene, alcohol, acetone), petroleum distillates (e.g. paint thinner, white gas), and liquid corrosives (e.g. sulfuric acid, muriatic acid, sodium hydroxide solutions). Typically, following the Washington state guidelines, the contractor opens the tank, checks the air with a volatile organic detector, and, depending on what is found, the water is tested to determine under what category the wastewater falls. If the exposure is minimal, protocol dictates that it be left alone. If exposure is major, the tanks must be cleaned or even removed. Water may have to be pumped out and treated off site, or if it is highly contaminated, it must be treated and disposed of as hazardous waste. Contaminated groundwater could be pumped, treated, and either re-injected into the ground, or discharged into the sewer system. Regarding the surrounding soil, under the direction of the environmental consultant, the contractor can perform an in-situ remediation of the soil, perform bioremediation, or remove the contaminated soil and replace it with clean soil, handling disposal according to state guidelines. Of course, treatment depends on whether the lab was a "mom and pop" operation or a major drug lab supplying a large metropolitan area for many years that could lead to a cleanup on the Superfund level. HVAC duct systems are also tested and often cleaned using high-efficiency particulate air filter-equipped vacuums and procedures similar to those used when asbestos has been detected. Following the remediation, the consultant tests and analyzes one final time. Every environmental professional is familiar with the growing area of Phase I environmental site assessments (ESA), which can provide a good general picture of the past and existing conditions on a site that could indicate a recognized environmental condition. Any transfer of industrial or commercial real estate now dictates that one be performed before any final transaction is made. It is incumbent upon environmental professionals to be able to recognize the signs of clandestine drug lab contamination when conducting Phase 1 ESAs. As was mentioned previously, these labs can be operating in hotel rooms, self-storage units, and apartment complexes. Some of the physical signs can be staining or etching on sinks, toilets, bathtubs, or stoves; brown and red staining on the walls and other surfaces that almost seem to bleed color when they are washed; and added ventilation systems located over work benches, in attics, or basements. Other hints may be blacked out or covered windows; chemical smells emanating from the property; compressed gas cylinders that have bluish staining on the valves; and an excessive amount of broken batteries, matchbook covers, road flairs, and rock salt in evidence. Once called the "poor man's cocaine," meth today is made primarily from pseudoephedrine, an ingredient in many over-the-counter cold remedies like Sudafed®. (The manufacturer, Pfizer, has just introduced a pseudoephedrine-free formula of the sinus and cold medication in direct response to the problem of illicit conversion of the ingredient into meth. In addition, many states now regulate the number of boxes of medication containing pseudoephedrine that can be sold at one time, keeping the product behind the pharmacist's counter.) Although the main ingredient is now being controlled by reputable sources like name-brand drug stores, it is still readily available over the Internet. While the snorting, injecting, or smoking of meth causes a seemingly endless list of negative side effects, such as rotten teeth, seizures, hallucinations, risk of heat attack, stroke, and liver damage, the laundry list of damage caused by being exposed during the cooking process is equally as horrifying. These include: sudden cardiac arrest upon inhalation, severe lung damage, eye and mucous membrane damage, severe gastric irritation, and coma. According to Attorney General Alberto Gonzalez, "meth carries huge collateral costs for our nation." The U.S. Drug Enforcement Administration (DEA) has committed $145 million each year to combat meth, and last year DEA Administrator Karen Tandy declared meth a top priority for the DEA's Mobile Enforcement Team. This growing menace, with its terrible impact on human health and the environment, should be on the radar of every environmental professional in the country. Meth is actually an old drug with a new name. First synthesized in 1919 by a Japanese chemist, A. Ogata, the earlier version called amphetamine was viewed as a stimulant, known by some as an "upper." Some physicians still use it for narcolepsy, Parkinson's disease, and overeating disorders. But once it was listed as a Schedule II drug in 1970 by the federal government, its mass illicit production went underground. For years it was almst exclusively made and traded by motorcycle gangs. Once DEA began regulating phenyl-2-propanone, the precursor chemical commonly known as P2P used in the production of illicit meth, it didn't take the drug trade long to figure out they could make meth without P2P. "The irony is that is was soon discovered they could use another precursor chemical, pseudoephedrine, and make a more potent, purer form of meth," Mullins said. It also didn't take long for drug suppliers and addicts to learn that the recipe for this new meth was readily available, found on hundreds of Internet sites, with most of the ingredients, like iodine and anhydrous ammonia, easy to obtain. Rather than depend on "professional" drug dealers for their supply, addicts and aspiring entrepreneurs soon opened up "mom and pop" shops in their homes and on their farms. Addiction to the stimulant first became a problem on the West Coast in California, Washington, and Oregon. For several decades, it has continued its progress eastward, through the Southwest and Midwest. Currently, Missouri tops the list of problem states, with more than 8,000 labs, equipment caches, and toxic dumps discovered between 2002 and 2004, according to an article in Newsweek magazine. While cocaine and heroin still dominate in the East, more and more labs are being discovered in southern states like Georgia and Tennessee. It looks like the last regions to be hit will be the Mid-Atlantic and New England areas, although there is a steadily growing number of reports of lab busts in those states.